A delicious party cocktail to warm your guests' spirits in the cold of winter. In a medium saucepan, melt butter. 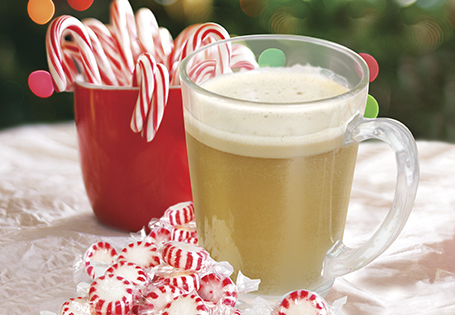 Add crushed candy canes, cinnamon and both sugars. Stir frequently until sugars are dissolved. In a medium bowl, combine sugar mixture with ice cream. Stir until completely combined. Transfer mixture to freezer and chill until stiffened, about 30 minutes. In a 12-ounce mug, add 3 tablespoons of ice cream mixture, 1 ounce dark rum and fill the rest of the cup with boiling water. Stir.